Hello there! I hope you are well! 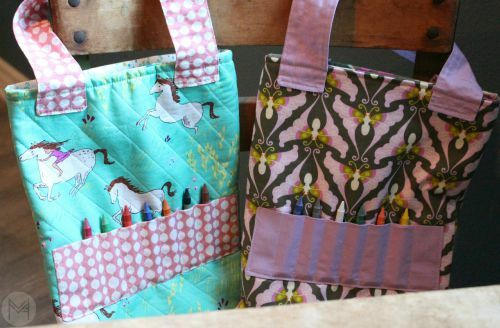 I have a super fun new sewing tutorial for you, How to Sew A Crayon Tote bag! 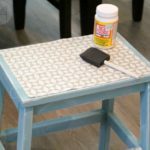 This is a very simple project, beginner friendly and I show you how to do all the steps. This past weekend I had 2 little girls birthday parties to go to. I have been wanting to make this bag for awhile, so this gave me a good reason do to so! 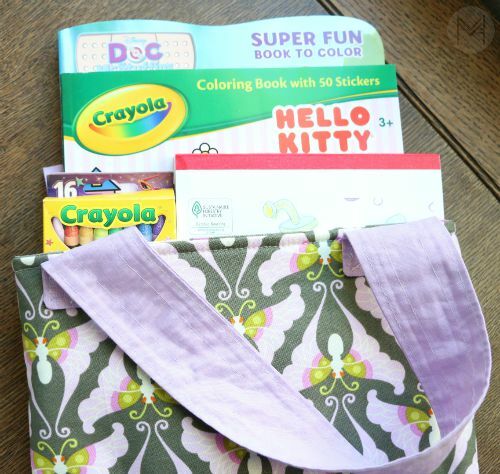 I have other crayon wallets, but my goal was to make Mom’s life easier with this project. 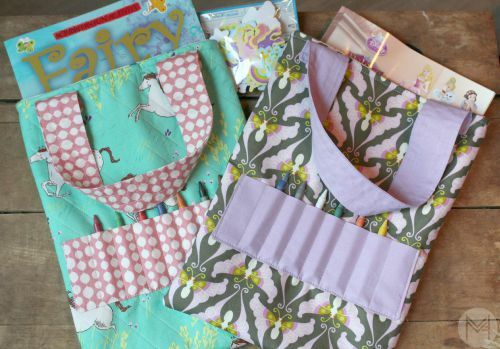 Some of the crayon wallets require you to cut up pieces of paper in order for the crayon wallet to be useful – I wanted to make sure this tote bag could fit an entire coloring book or sticker book. This way, it makes car rides, restaurants or other outings a little easier and Mom doesn’t have to remember to cute up some more paper! Plus, kids love to be able to be in charge of what toys they bring. 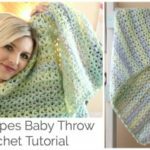 – Fold pocket in half lengthwise right sides touching and using 1/4 inch seam, sew along the raw edge leaving a few inch gap to flip right side out. -Pin pocket in place 4 inches from the bottom of the bag and 1 inch from the sides. -Sew the pocket down the side, along the bottom and other side making sure to backstitch at beginning and end. -Sew outer pieces together. Place right sides together and sew down side, bottom and side using 1/2 inch seam allowance. Optional: Stitch 2 additional lines down the strap. Sew 5/8 inches from each edge. Backstitch at beginning and end. -Pin strap in place 1 inch from the sides of the bag and 1.5 inches from the top. Pin 3 remaining straps. 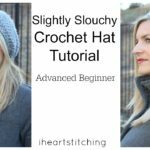 -Sew along the top stitch seam line of the strap back stitching at the beginning and the end. Do for all 4 strap ends. 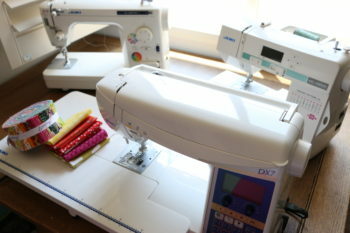 -Pin the side seams first and then pin the remaining bag in place and sew a 1/2 inch seam allowance. Be sure nothing is getting caught underneath the bag. -Top stitch around the top of the bag using a 1/4 inch seam allowance and include the straps in the stitching for added security. Here are a few coloring books from amazon that I was drooling over myself! *These are amazon affiliate links. Using my links earns me a small commission and helps me purchase supplies for more videos! THANK YOU for the support! 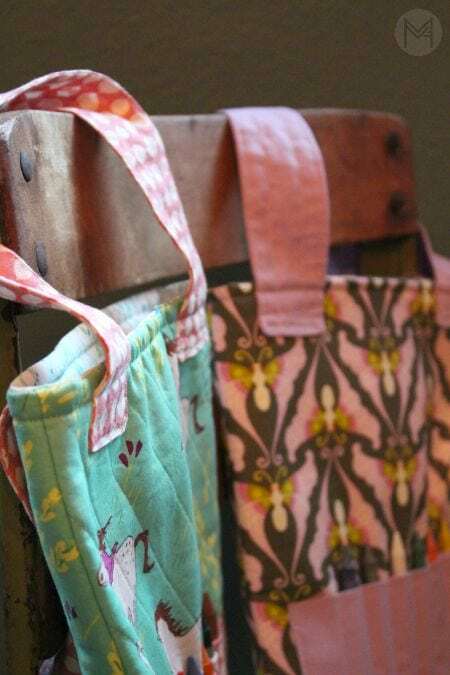 Here are a few of the things I put in this tote bag the gift. Now, my daughter is begging for her own! She has already picked out her fabric! My son wants one too! Here is my 4 year old cutie showing off how well it fits on a little kids arm! Hi there. I stumbled upon this project on Pinterest and immediately fell in love with it. Your directions are very clear and easy to follow. I love the fact that you have a video tutorial for it as well. I have mad 3 since discovering it. My question is at what point could I add a magnetic clasp so the bag can close? Any insight you have would be greatly appreciated. Thank you for sharing the pattern. It’s amazing. Hi Melanie. I was so happy to find your project on Pinterest. 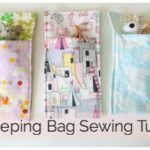 I so heart this project so I included it on my round-up post about sewing projects you can make for your kids. I made this tote last night. Your directions are very clear & easy to follow so my tote actually turned out well! I think our granddaughter is going to love it. Thanks so much for sharing your talent w/us via Youtube and your blog. I love your videos! My drawing niece is going to be 6 next week and I thought to make it for her since I saw your tutorial (I watch all of them). I’d love to send you a picture but I’ not on social networks. Thank you for your ideas, your energy and your always nice mood. Melanie, This has to be one of my favorite projects. Your tutorial is excellent. Love love making these bags for my favorite children in my life and also making for the elderly in my mom’s assisting living home. 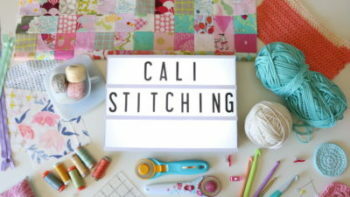 A very cute, fast project! You always use such beautiful fabrics, Melanie! Thank you for making these video tutorials! 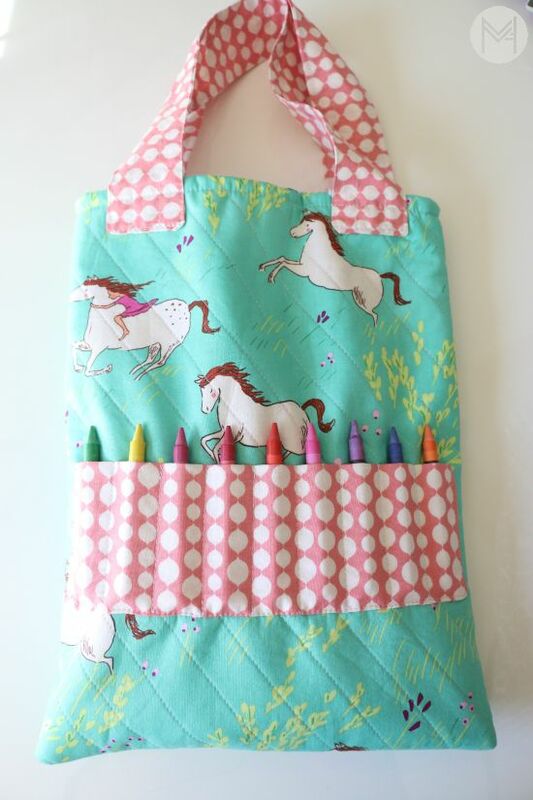 Thanks for the idea, I’ll be making one for my 18 months granddaughteer; she’s at a daycare and she loves to carry bags. IEmma Marie will love it. 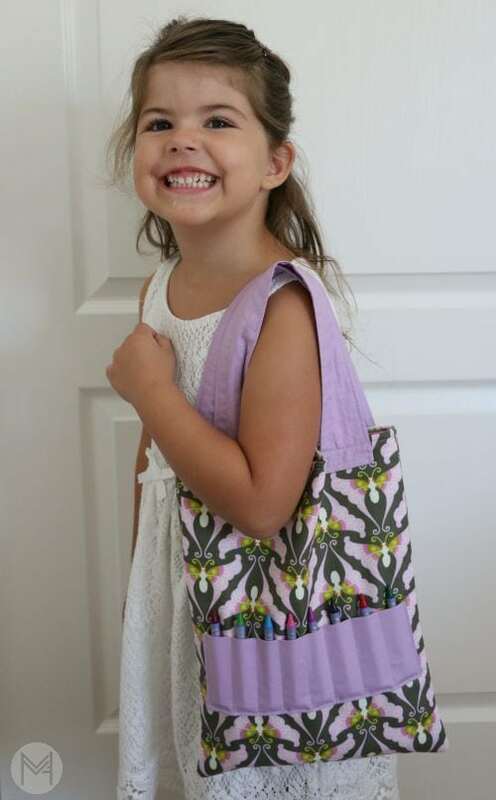 Cute picture of your daughter with her bag. I have a grand-daughter who will be 5 in Nov. She would get lots of use out of this and I have some Cinderella fabric and time to finish it. This such a great DIY Christmas gift to give to kids too! I’m going ti have to make a few myself.